The first computers were bulky, expensive, and generally pretty slow. As time has passed, our computing has become more and more portable. Today, we carry around pocket PCs in the form of our smartphones. While these mobile devices have replaced much the basic functionality of larger desktop and laptop computers, these devices run software that is not really suitable for some work environments. What if we could merge the portable PC and the desktop PC? The concept has existed for some time, and some early companies took a stab at it, but the execution always fell short in one way or another. Even some early Android devices such as the Motorola Atrix 4G tried to merge a desktop OS with a smartphone, but that required you to buy an Atrix 4G and purchase the extra dock, which held it back from widespread adoption. In the Android space, Andromium tried to bring an Android-based desktop experience to plenty of phones, but the project was overshadowed by bigger offerings, including Microsoft’s Continuum. Fortunately, there’s Maru, a new software solution bridging the gap between phone and computer, and it doesn’t require you to buy new hardware. All you need to do is flash a new custom ROM, something many of us here at XDA are intimately familiar with. Announced on February 4th of this year, Maru is a one-man project that has already garnered widespread attention on websites such as Hacker News and Reddit. The project aims to bring a full desktop experience to any monitor via simply connecting your mobile phone to the display. The best part is that it doesn’t render your phone inoperable; in fact, you can use your phone for calls, texts, etc. while the desktop OS is running on the external monitor. The entire package, kernel and OS, runs off of your smartphone. In particular, you’re getting a build of Debian 8 running on the Linux kernel. Debian is installed inside a chroot within Android. 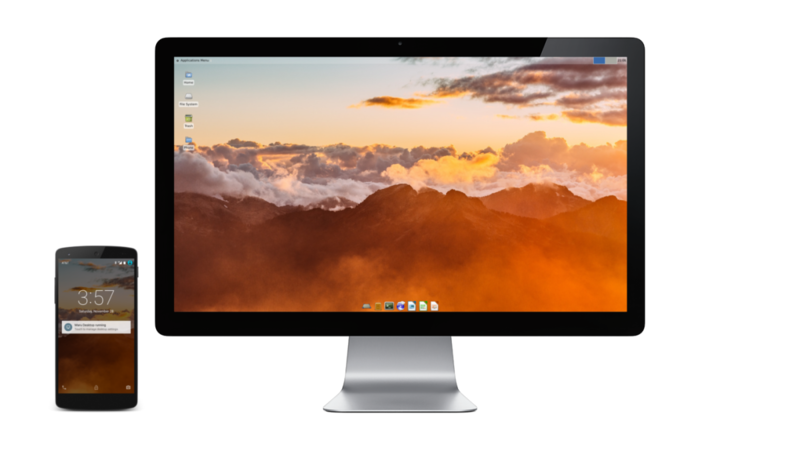 Several other apps have allowed you to install a Linux distribution on your Android smartphone via chroot already, but Maru’s beauty comes in its simplicity and ease of use. Maru is installed as a custom ROM on your device (for now). When the Maru app detects that your Android phone has connected to an external display (via HDMI, slim-port, etc. ), it launches Debian via chroot and outputs Debian solely to the secondary monitor. All while your phone is still running Android, untouched! It’s not exactly clear how the developer has achieved this yet. The ability to create Presentations on secondary displays already exists within Android, so it’s possible that Maru is cleverly taking advantage of some API to seamlessly move between Android and Debian. Perhaps that’s why it needs to be installed as a custom ROM? Or maybe it’s running under an LXC (Linux Containers)? Thankfully, we don’t have to wonder how Maru works anymore, because the project is going open-source. Thus far I’ve glossed over the fact that Maru currently only runs on a Nexus 5. The Nexus 5 is not exactly an obscure device, but I’m guessing that many of you have moved on to greener pastures. But with the news that the project is going open-source, that fact will hopefully be no longer relevant. The custom ROM development community is a large, dedicated force of nature and we’re sure that as the Maru project gains momentum in the eyes and ears of the Android community that more developers will take up the mantle and port the ROM to their devices. If you’re a member of XDA you’re likely familiar with the work that many developers volunteer their time to maintain, and we expect exciting projects such as Maru to kindle that flame of development. After all, we Android fans can’t let Microsoft have all the fun, can we? As with every open-source project, Maru’s future depends on support from the community. The developer is looking for help to continue expanding the project and can be reached via his e-mail or Twitter handle.